Unable to wage a full interstellar invasion, the Black Talon strike forces and their CEF/Caprice counterparts conduct raids and commando operations deep behind enemy lines. As stealthed shuttles glide through previously unknown Gates, both sides wage a quiet war to cripple the other's strategic assets in preparation for a future rematch. And sometimes, they have to contend with trouble at home as well. * Background information on the strike operations and the teams conducting them. * Instructions and techniques on building and painting miniatures and terrain, presented in glorious colour. * Basic listings for both raiding and defending forces from the Northern Guard. Southern MILICIA, CEF and other armies. * Tactical and roleplayihg scenarios that can be played together or separately. * A detailed scenario generator to construct your own raiding scenarios. 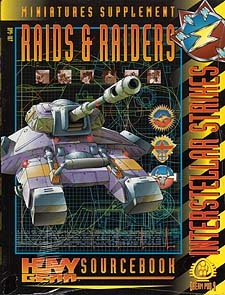 A copy of the Heavy Gear tactical rules, a few 6-sided dice, miniatures, pen and paper are required to use this supplement.